The Sky team launch. Blue colors, mod hairdos and Sky gangsters. It's a blue, blue, blue world. The Sky, in case you were plagued with doubt, is blue. 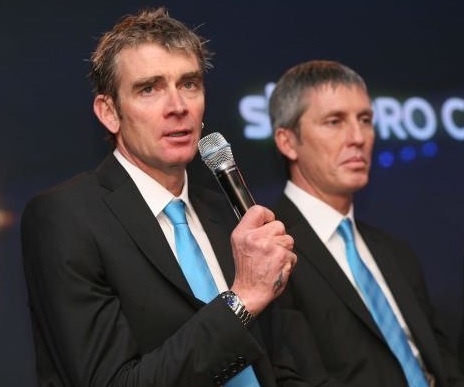 The no-euros spared launch of Team Sky in London was a triumph of color coordination and fashion unity. Chapeau, fashion designers and haberdashers. Suits with sky blue ties, team car Jaguars with blue grilles and underbody trim parked next to blue columns, Pinarello Dogma bikes in blue trim, cycling shoes with blue soles. Plenty of green behind all that blue. Contrast this to Team Radio Shack, with its endless circle R cowboy brand on everything. Sky is much classier, cooler, styled and mod. Like a glossy vodka advertising campaign — all sheen and the promise of fantasy fulfillment. You know, like winning the Tour de France or something. Where was the Skyy vodka, by the way? A social critic once called the original mods: “Fashion-obsessed and hedonistic cult of the hyper-cool.” Throw in a high VO2 max and a $10,000 bike and you’ve got the picture. They don’t need Sting on an Italian motor-scooter in Quadrophenia, they got Pinarellos in jello-blue. Then there were the Sky haircuts. Not only is this a British team that’s big on blue, they’re taking a style cue from Mod of the moment, Bradley Wiggins. This was most evident in the 60’s mod style on Wiggins, Edvald Boasson Hagen and Thomas Lovkvist. There’s obviously a team hairstylist to go along with the team mechanics. And why not blue hair? This was the mod-revival, not the 70’s version, the 2010 version. Scary thought: after the London mods, came the skinheads and team manager David Brailsford already looks a bit like one. Are we just in a transition phase — will team Sky riders in 2011 sport shaved heads or work the Uncle Fester vibe? While there were no podium girl presenters in shimmering sky blue bikinis, there were plenty of gangsters in dark suits and blue ties. (That’s the Sky business model — they’re not some slap-dash Italian team.) This reminded Twisted Spoke of the tough blokes in Guy Richie’s movie, Lock, Stock and Two Smoking Barrels with Scott Sunderland as mob boss Hatchet Harry. We always liked Sunderland when he wrote his diary for cyclingnews back in his riding days — a tireless worker and a true road captain. But a man’s got to light a fire under the lads, right? If Sky goes winless for 6 months, expect a variation on this cockney monologue: “Right, I had to cut off three of Lovkvist’s fingers, I had Ben Swift chopped up and fed to the pigs — you think I’m joking? You think this is an effing joke? Wiggins, you having a laugh? I’ll wrap that effing Pinarello round your throat. Yatesy, get out the bleedin’ chainsaw…” It could happen. Team Sky is ready to rumble as they say in the World Wrestling Federation. Look for them in the pro peloton — they’re in the blue, luv. « Andy Schleck voted Luxembourger of the year. Attempt to move Frank into second place fails.